Stauromedusae UK - Depastrum cyathiforme - Scientific Proceedings Royal Dublin Society. VOL. VIII., PART II. 180-183. 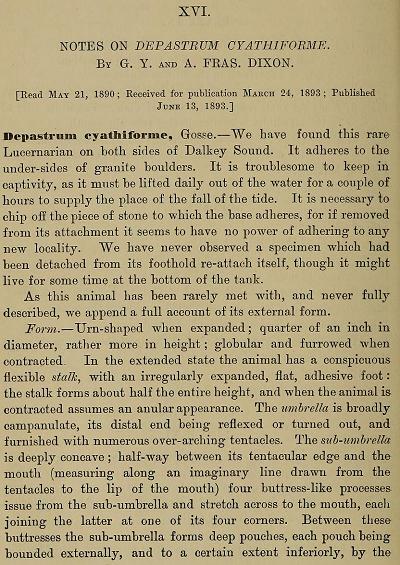 Depastrum cyathiforme - Scientific Proceedings Royal Dublin Society. VOL. VIII., PART II. 180-183. By G. Y. and A. FRAS. DIXON. Depastrum cyathiforme, Gosse. — We have found this rare Lucernarian on both sides of Dalkey Sound. It adheres to the under-sides of granite boulders. It is troublesome to keep in captivity, as it must be lifted daily out of the water for a couple of hours to supply the place of the fall of the tide. It is necessary to chip off the piece of stone to which the base adheres, for if removed from its attachment it seems to have no power of adhering to any new locality. We have never observed a specimen which had been detached from its foothold re-attach itself, though it might live for some time at the bottom of the tank. As this animal has been rarely met with, and never fully described, we append a full account of its external form. Form. — Urn-shaped when expanded ; quarter of an inch in diameter, rather more in height ; globular and furrowed when contracted. In the extended state the animal has a conspicuous flexible stalk, with an irregularly expanded, flat, adhesive foot: the stalk forms about half the entire height, and when the animal is contracted assumes an anular appearance. The umbrella is broadly campanulate, its distal end being reflexed or turned out, and furnished with numerous over-arching tentacles. The sub-umbrella is deeply concave ; half-way between its tentacular edge and the mouth (measuring along an imaginary line drawn from the tentacles to the lip of the mouth) four buttress-like processes issue from the sub-umbrella and stretch across to the mouth, each joining the latter at one of its four corners. Between these buttresses the sub-umbrella forms deep pouches, each pouch being bounded externally, and to a certain extent inferiorly, by the sub-umbrella, internally by one of the sides of the quadrilateral columnar mouth-tube, and laterally on each side by one of the buttresses. The mouth is very variable : it is at one moment a plain four- sided funnel ; at another it is closed and folds its thick lips so that the oral aperture becomes a mere slit, or perhaps four slits, arranged like a St. Andrew's Cross. In large specimens the limbs of this cross may be still further modified by zig-zag foldings. The tentacles are knobbed and numerous : in normal specimens we have never found less than thirty-six, and never more than ninety-six. In small specimens they are set in a single row; in large specimens they are set in two or more rows, and are divided into eight groups. We believe the following is the arrangement that obtains in adult forms: — eight small tentacles are more remote from the mouth than the rest ; four of these correspond accurately with the buttresses and mouth-angles, and divide the tentacular margin into quarters, the other four mark the centre of these quarters. Each of these eight principal tentacles has a small tentacle on either side and a little in front of it. Sometimes these small tentacles are not knobbed, but rather pointed ; in large specimens, however, they are knobbed like the rest. Between each pair of these groups, consisting of the principal and adjacent and small tentacles, are nine large knobbed tentacles, in each alternate eighth of the margin four of these being in front and five behind, five being in front and four behind in the remaining eighths. There is a slight rim or parapet outside the tentacles ; the tentacles do not appear to be retractile, but when the animal closes, tliey are turned inwards and downwards, and covered by the rim being drawn closely over them. Colour. — Dirty chocolate-brown throughout, the stalk being paler than the rest, the darkest portion being the masses of generative organs which appear through the transparent body-wall. The tentacles have a core of dark colouring both in the tube and in the knobs. The stalk also has a dark core, while the expanded foot is transparent. Some individuals obtained at Dalkey exhibited a bright brick-red colour shining through their tissues. These individuals were growing among colonies of Amoeroecium proliferum (Aplidium proliferum), the colour of which they resembled. In the allied forms, Depastrella, Tessera, and Tesserantha, Haeckel figures ridges running along the umbrella, and dividing it and the stalk or crest into four regions. No such ridges are to be seen in Depastrum cyathiforme. In his description of this animal, Allman states that the stalk is ringed regularly. We have seen rings on the stalk when it is not stretched to its full length, but they are not constant, are sometimes incomplete, and invariably disappear when the animal is erected to its full height. In adult forms the umbrella usually exhibits a somewhat quadrilocular form, being bulged out by the the large bundles of generative organs which are arranged in four V-shaped dark masses, and may be distinctly seen through the more pellucid body-wall. In a few specimens we found existing a hexagonal, not an octagonal, arrangement of the parts; one such specimen had 108 tentacles in twelve groups of nine each, approximately equal. The tentacles, when the animal was not quite expanded, appeared not to be arranged in groups, but to form three continous rows. Sections of this specimen showed that it possessed six mesenteries, six gastro-genital pockets, and six radial chambers. We found that the arrangement of mesenteries and chambers in normal specimens, as revealed by sections, agreed with that described by H. James-Clark. Sections cut across a very young specimen demonstrated the absence of the radial chambers in the earlier stages of growth. Longitudinal sections show that the animal possesses a circular muscle, ectodermal in origin. The mesogloea is thrown into a number of folds which project out into the ectoderm, and on which the muscles cells are arranged. The muscle is well defined and by no means diffuse. It is situated outside the tentacles, and its presence will account for the appearance of the contracted animal. As the result of the careful examination of numerous specimens, continued over an extended period of time, we are of opinion that the animals described by Sars, Allman, and Grosse, must all be relegated to one and the same species as that which we have found. We believe that the different points of distinction attributed by Sars to Lucernaria cyathiformis (Fauna Litt. Norveg. [1846J p. 26, pl. 3, figs. 8-11), by Allman to Carduella cyathiformis (Quarterly Journal of Microscopical Science , vol. viii., p. 125, pl. 5, figs. 1-6), by Grosse to Depastrum cyathiforme (Ann. & Mag. Nat. Hist. vol. v., p. 481), are due to the variations to be met with in specimens of different ages and sizes, and to the variability of habit exhibited by the animal. This view has already been suggested by H. James- Clark (Journ. Boston Soc. Nat. Hist. vol. vii., p. 550, n.